the capital of North Vietnam (since 1954) and a manufacturing and cultural center, is located on the Red River, 75 miles from the seaport of Haiphong. The city was occupied by the French in 1883, became the capital of Tonkin and then of French Indochina from 1887 through 1946. The tram system opened Nov. 10, 1901. There were five lines operated with 51 cars over 29 km of track, including a long suburban route to Hadong. The postcard shows one of the early trams with a trailer. The system was extensively photographed by railfans between 1984 and closure in 1990.
the capital, principal port and commercial center of South Vietnam, is laid out in French style with wide boulevards, many parks and public buildings. The city was captured by the French in 1859 and became the center of Cochin-China. The steam tramway that opened on Dec. 27, 1881, was not electrified until Aug. 4, 1923. 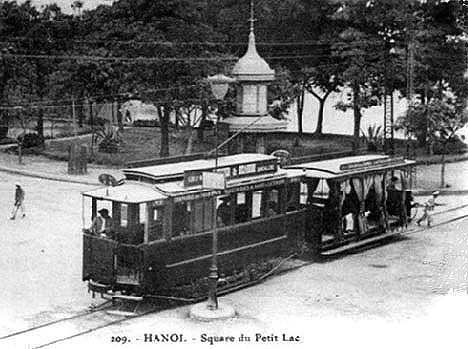 The meter-gauge electric tramway was a rural network of 72 km with two long interurban routes to Hoc-Mon and Thudaumot. 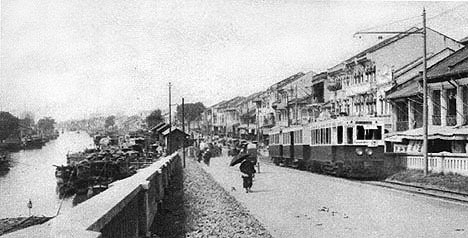 The postcard shows cars at the end of one of two lines in the native city of Cholon. The system closed ca. 1953.